SUN, SEA, SAND, CLUBBING AND A GORGEOUS CHARTING EXPERIENCE. The entertainment possibilities are infinity to enjoy your Ibiza limitless weekend. Discover the white island on board of a Super Yacht, surrounded by uncharted beauty, deserted beaches, beautiful cliffs, first line incredible sunsets and quiet anchorages. 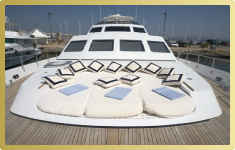 Ibiza Vip Agency can also organize your private cruising from all main mediterranean ports. 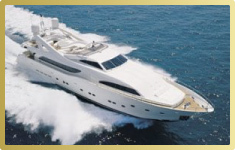 Perfect for groups, charting with a Super Yacht offers all the eminence and advancement, creating a positive atmosphere to conduct business and pleasure an unsurpassed taste of freedom . The expenses for our charter formula are comparable with a luxury villa rental, but with definitly much more flexibility and variablity. This yacht is a splendid ALALUNGA Super Yacht, built to the highest safety and quality standards required for Commercial Certification by the well-known Spertini Shipyard. The generous dimensions, with her 33 meters length and about 8 meters beam, enable this sea jewel to have internal and external areas usually found only on much larger yachts. Certified to cruising with a maximum of 40 passengers. 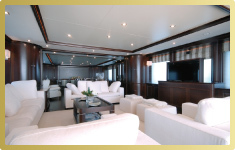 Benetti Sail Division builds boats of a timeless elegance. It strength, safety and durability enable us to achieve the subtle marriage between tradition and modern technology. Discover the classic and the beauty of the Benetti 37 and enjoy a perfect harmony cruising. Exclusive, bright the Ferretti allows you to enjoy the navigation whilst comfortably seated in its luxurious cabins or in one of its two extra ordinary on-deck solariums. This very elegant yacht provided with all the conveniences for the most demanding guests, suitable both for private cruises or Corporate Charter Services. 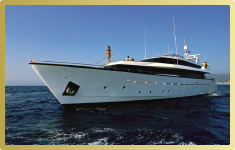 This luxury yacht is a refined and comfortable Picchiotti Yacht of 33 meters. With spacious internal and external areas, giving the maximum comfort and relax to the guests on board which will appreciate the charm of this Italian designed motoryacht. Ibiza Vip Agency can provide you on request any type of Mega Yacht during the summer 2018 with permament mooring. 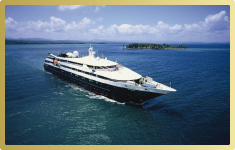 We customize every Mega Yacht charter to the individual convenciences and likes of our clients and we arrange every aspect of your charter vacation for an unforgettable experience. We providing exceptional customer service and outstanding personal attention to every detail for our customers.